The Crimson shared the Ivy League regular season title this year, and did so without Seth Towns. Next year, Towns, Bryce Aiken and the rest of the gang are back. 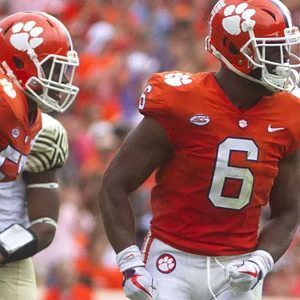 RALEIGH, N.C. — Bryce Aiken was visibly disappointed. He stood at the top of the key, head hanging, with his hands on his knees. With seven seconds left and his Harvard Crimson trailing N.C. State by two points, Aiken had the ball and then lost it. It was a costly turnover in the second round of the National Invitation Tournament. As C.J. Bryce swished the first free throw for the Wolfpack, Aiken shook his head. When Bryce sank the second, a four-letter word left Aiken’s mouth. Aiken’s Crimson teammate Rio Haskett would sink a three-pointer with two seconds left, but N.C. State inbounded the ball cleanly and eluded a Harvard foul. For Aiken, Haskett and Harvard — the last men’s college basketball team standing in the Ivy League — their season and NIT run came to a halt in the historic Reynolds Coliseum last Sunday night, losing by a single point. The loss, of course, was an extremely disheartening way for Harvard’s season to end. In Amaker’s 12th year at the helm of the Crimson, they went 19-11 and captured a share of the regular season Ivy League title. They took a non-conference win over NCAA Tournament-bound Saint Mary’s, won two-of-three meetings with Yale, and beat Georgetown in their NIT opener. And then the Crimson pushed N.C. State — a KenPom top 50 team with a win over Auburn and a 9-9 record in the ACC — to the brink. 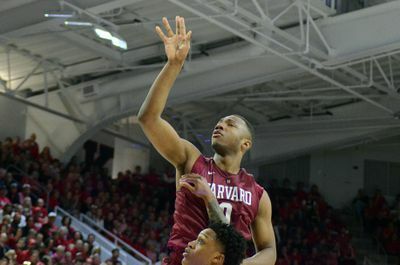 Harvard was undone by 17 turnovers and a 26.3 percent three-point shooting performance. The Crimson also allowed the Wolfpack to grab 17 offensive boards. That didn’t help their chances of pulling off a postseason road upset over an ACC team either. “In the second half, how much they got off the backboard made a huge difference,” Amaker said. 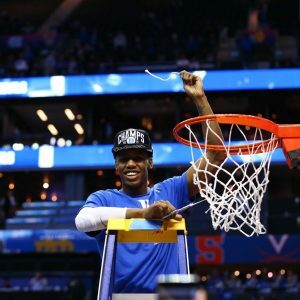 When seasons come to a close for college basketball teams, it’s difficult to immediately look ahead. For a lot of squads, it’s the last competitive game many players will play in. Seniors are moving on. Tears are rolling. But with Harvard, it’s tough to not look forward. And it’s hard to feel anything but optimistic about what’s next for the Crimson. Harvard’s Bryce Aiken prepares to inbound the ball against N.C. State in the second round of the NIT on March 24, 2019 in Raleigh, N.C.
Next year, Aiken and three other starters — Noah Kirkwood, Chris Lewis and Justin Bassey — are back. And so are the four bench players Amaker relied on the most: Haskett, Christian Juzang, Danilo Djuricic and Robert Baker, who each averaged between 14 and 30 minutes of playing time per game. Indeed. Did we forget about Towns? A 6-foot-7 forward from Columbus, Ohio, he was heralded as a three- and four-star prospect by many recruiting sites. According to 247sports, he held offers from Michigan, Ohio State, Butler, Iowa, Purdue, Virginia Tech and Xavier, among others. He chose Amaker and Harvard, and as a sophomore was named Ivy League Player of the Year and earned All-American Honorable Mention status while averaging about 16 points, six rebounds and two assists per game, and shooting 44 percent from three-point range. On Dec. 2, 2017, he dropped 25 points on then-ranked No. 7 Kentucky. To start the 2018-19 season, he was on the watch list for the Lou Henson award. But Towns never saw game action for Harvard this season as he battled and recovered from an apparent knee injury. In short: Towns is not the typical type of talent that lands in the Ivy League. But neither are many of the guys that make up this Harvard roster. Aiken, a dynamic 6-foot guard, chose a Harvard education over joining the basketball squads at Miami, Seton Hall, Auburn, Buffalo, Florida State and Rhode Island. 247sports tabbed the Elizabeth, N.J. native as a four-star prospect. He battled a knee injury this year too, but returned just in time for Ivy League play and averaged 22.2 points, 2.9 rebounds and 2.6 assists per game. He scored 19 points against N.C. State and gave Wolfpack defenders all they could handle. Harvard’s Chris Lewis releases a floater over an N.C. State defender in a second round NIT game in Raleigh, N.C. on March 24, 2019. Chris Lewis, another four-star prospect that Amaker landed in that 2016 class, was also big in that game. 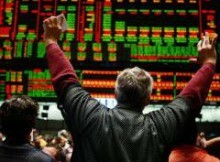 The Alpharetta, Georgia native is the son of former NFL linebacker Mo Lewis — you may know him as the guy that sent Drew Bledsoe to the hospital with an Earth-shaking hit, which kickstarted Tom Brady’s career. Chris had offers from Georgia Tech, Memphis, Miami, Notre Dame, New Mexico and Texas A&M. He is the highest-rated recruit to choose Harvard under Amaker. The absence of Towns this season allowed other Crimson players to step up, one of which was Noah Kirkwood. Pegged as a four-star combo guard from Northfield, Massachusetts by 247sports, Kirkwood held offers from Tulane, Pitt, George Washington, Texas, Vanderbilt, Virginia, Virginia Tech, St. Bonaventure and Wichita State. He opted for the Ivy League and lit it up as a freshman this past season, taking home the league’s Rookie of the Year award while averaging 11.1 points, 4.4 rebounds and 1.9 assists per game while shooting 39.8 percent from three-point range. Kirkwood was leading the way for Harvard during stretches against N.C. State, showing off his ability to handle the ball, shoot and defend. 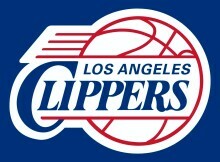 He totaled 19 points, five assists and four rebounds, but fouled out with about six minutes to play. Harvard trailed by just a point by that moment. Had Kirkwood remained in the contest, Harvard might’ve survived. 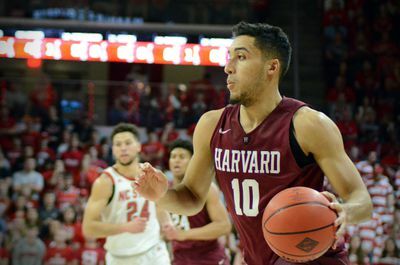 Harvard’s Noah Kirkwood drives to the basket against N.C. State on March 24, 2019 during a second round NIT game in Raleigh, N.C.
Amaker has turned Harvard into legitimate winners. Since arriving on campus in 2007 after a six-year stint at Michigan, the former Duke guard has led the Crimson to seasons of 18-or-more wins nine times. They’ve been to the NCAA Tournament four times and the NIT three times. 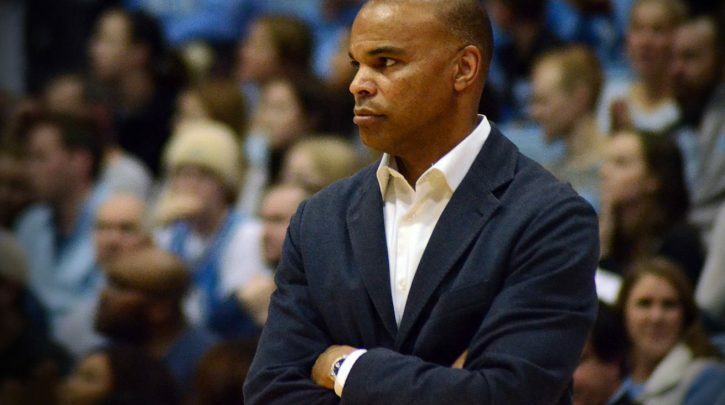 Amaker’s Harvard teams have a 69 percent winning percentage in Ivy League play and 230 overall wins. 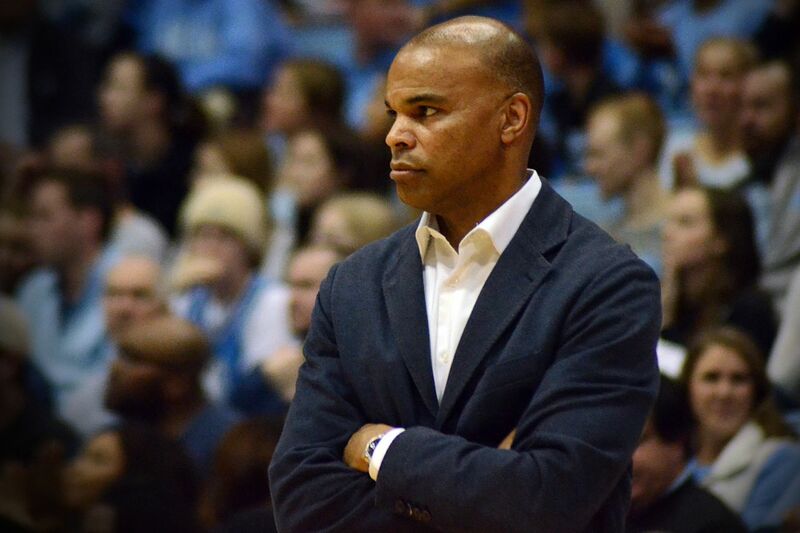 And when facing the conference he used to play in, the ACC, Amaker’s Crimson teams are 8-6. 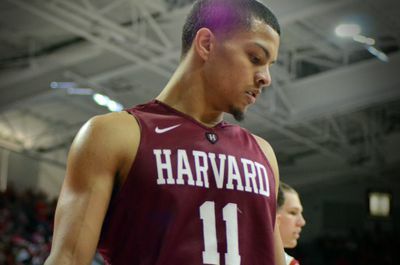 Despite not having Towns all season, Aiken missing nearly half of it, falling in the Ivy League title game to Yale, and losing to N.C. State in the final moments of a second round NIT game, this season was a win for Harvard. Still, hunger for more remains. “I’m proud of what we accomplished,” Amaker said. “We didn’t do all that we wanted, but we were certainly able to accomplish a lot with what we went through with injuries. Winning the regular season in our conference was a significant achievement and losing the conference tournament championship was a big blow. That’s OK. Next season, Harvard will be even better.